Counseling is a process where the counselors analyze an individual’s problems and plan necessary actions to help him/her. Counseling is an important part of the army. It is used for analyzing a soldier’s potential, planning his/her growth, achieving milestones, and making an improvement to his/her non-tolerated behavior. Army Counseling is a confidential matter and needs to be done professionally. 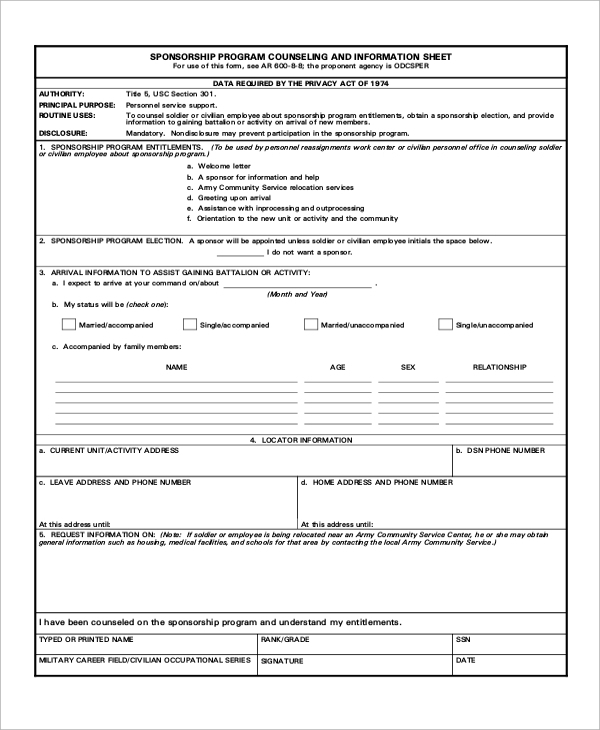 Below is a list of army counseling Sample Forms for various purposes like army development, learning, sponsorship, etc. Explore them. 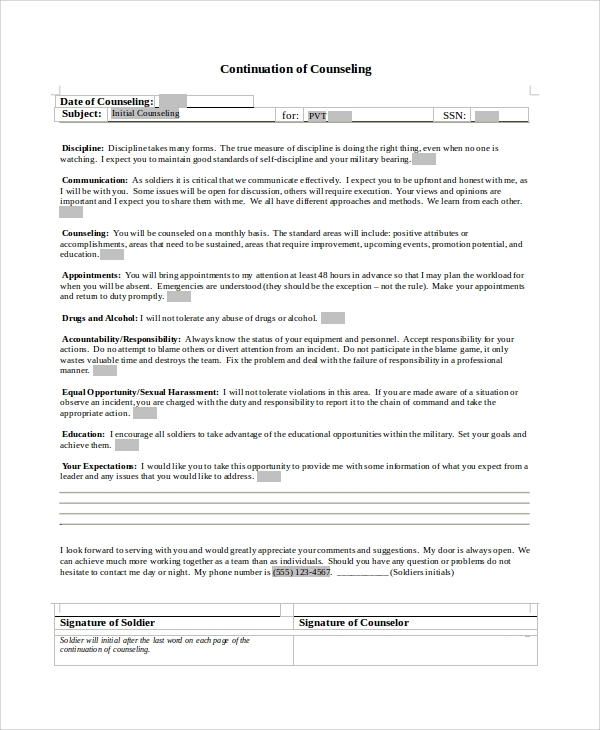 Download this MS-word document and get an editable counseling form. 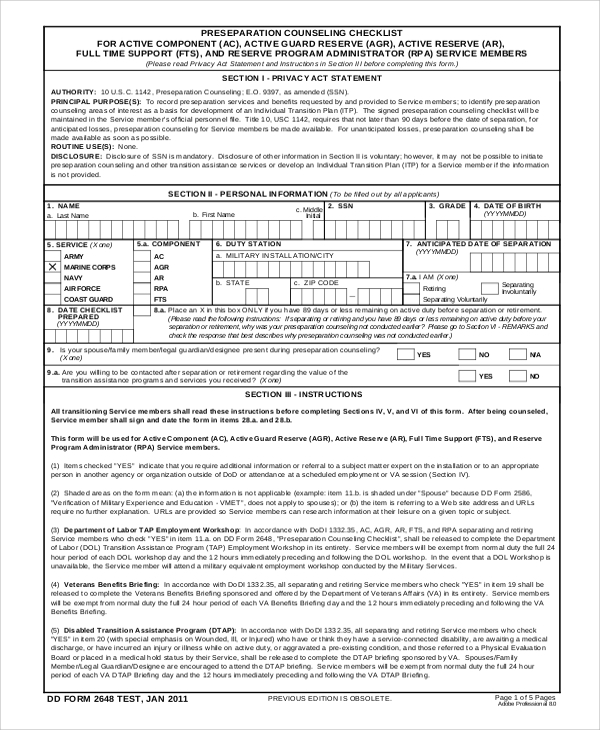 It contains few input fields like counseling date, subject, SSN, and signature spaces along with the instructions to be followed by the soldiers. 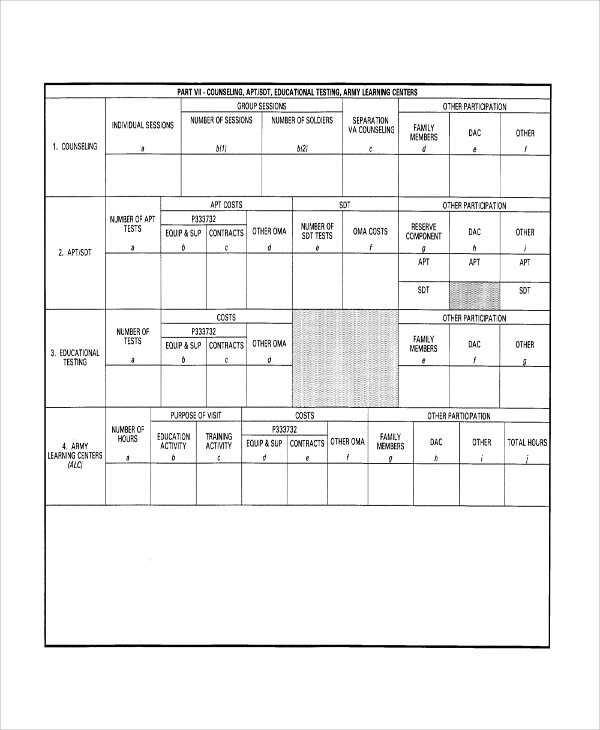 This form can be used by the Army counselors to plan custom individual soldier development programs. Download this PDF and take a print out for customization. You may also see the Sample Medical Forms. Download the Army learning center counseling form and get access to it. The PDF contains education lessons along with blank counseling templates. Army life is not as simple as the life that everyone else leads. Soldiers need to live alone from their family for months, and they face a struggle at every single instance. There are various problems that a soldier faces during his/her duty like emotional pain, stress, mental pressure, and aloneness, etc. It makes soldiers weaker and to help them in dealing with above situations, army leaders and supervisors conduct counseling programs for the needy soldiers. Also, army officers conduct counseling programs to analyze a soldier’s potential, his/her individual growth. Many Army leaders use counseling as a tool to deal with a soldier’s non-tolerated behavior. You may also see the Sample Army Forms. 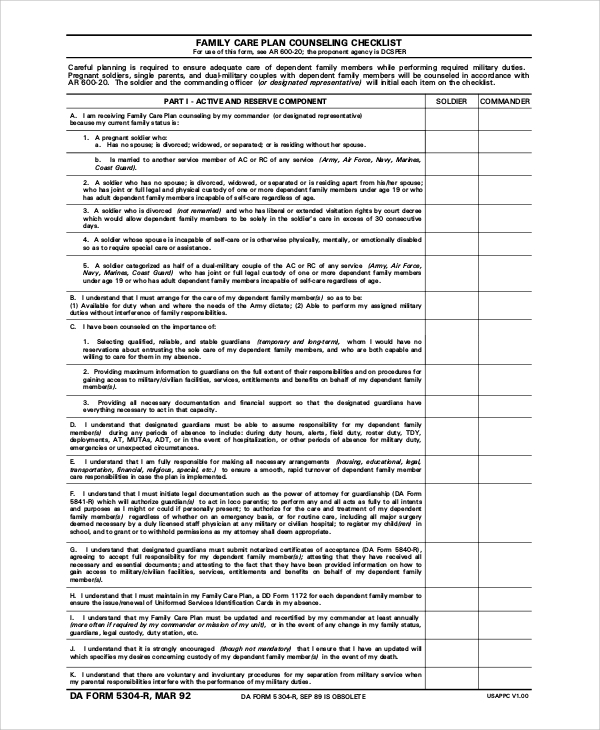 Download this Army sponsorship program counseling form and information sheet form and print it for customization. You can use it to counsel civilian employees and soldiers. Family care plan counseling enables the soldiers to preplan family care during his/her absence because of army duty. This PDF form can be used to counsel pregnant, single parents, and dual-military couples. You may also see thr Sample Army Memos. 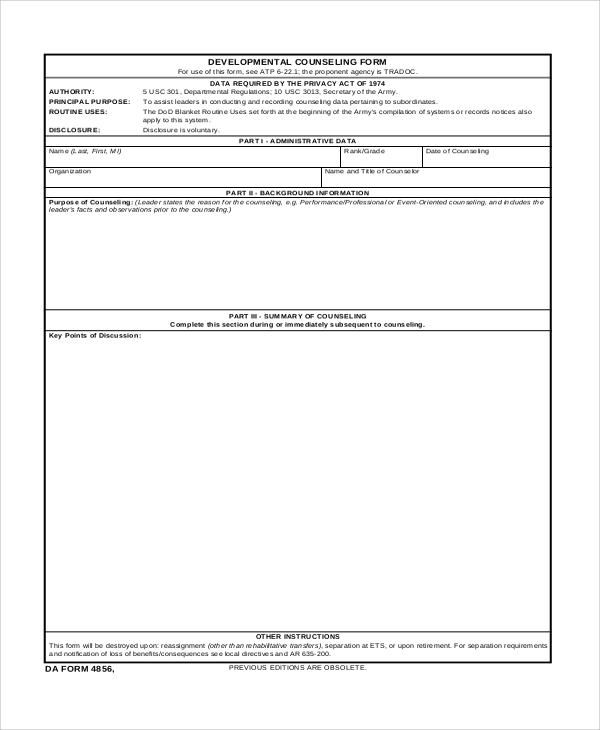 Army leaders, army supervisors, army medical counselors, and other authoritative rank officers can use the above army counseling forms to help their soldiers fight against their personal problems. 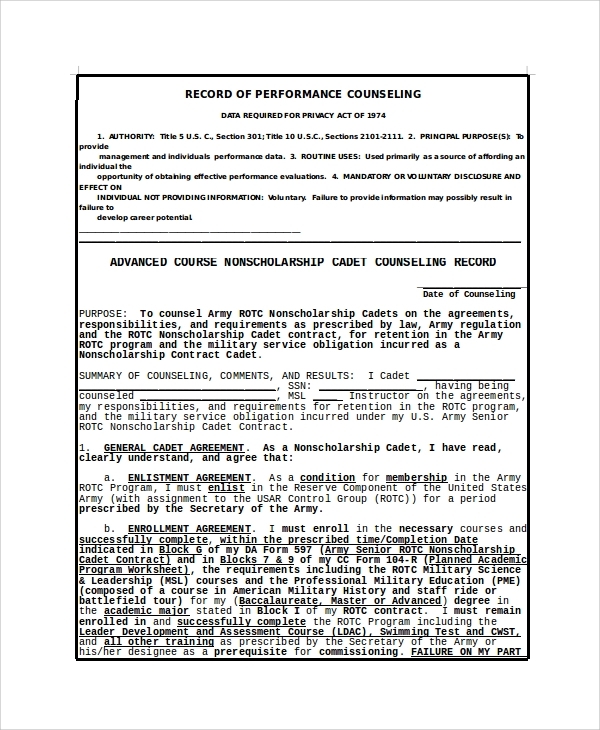 You can conduct individual soldier counseling by downloading the above forms. Our counseling forms are ready-made pieces that do not need designing efforts. You can download the PDF documents, print them and make the counseling sessions an easier task. Also, have a look at the Army Memo Samples.